This recipe from Nick Massie of PaleoNick.com combines wild shrimp, Italian sausage, zucchini and squash “noodles,” and a creamy Thai-inspired sauce to create a healthy path to the satisfaction of a pasta dish without loading up on carbs. First, Massie crushes and minces the garlic cloves before toasting them in a heavy cast-iron pot prepped with olive oil. He then adds the sausage to the pot, and while he waits for it to brown, he uses a mandolin to slice the zucchini and squash into long, noodle-like strips. The noodles are then added to the pot with the sausage and garlic. also make it seem like there’s more shrimp in your dish than there really is,” he explains. 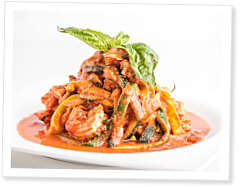 Once the proteins are cooked and the noodles are softened, the tomato puree, coconut milk and basil chiffonade come together to make the sauce, which is then blended with the other ingredients. The whole mixture is piled high and garnished with a sprig of basil. This dish is “proof positive that you don’t have to say ‘basta’ with the pasta,” Massie says. To download the recipe for creamy shrimp zucchini, click here. Additional reading: “Sweet Potato Volcanoes” by Shirley Brown and Alyssa Dazet, published July 17, 2012.